SAP BusinessObjects enterprise offerings include state-of-the-art Business Intelligence solutions, Enterprise Information Management and Performance Management tools, all designed to help define business strategy and close the gap between strategy and execution. As a SAP Gold Partner and PCoE, we offer the best pricing, service and support. To find out how we can help, call us today on UK +44 (0) 845 643 0592 or email contact@influentialsoftware.com. Pricing is dependent on the size of your business and the specific tools/CPU/roles required. In addition to best pricing, we offer consultation to ensure you get the most from your investment, including our standard package services; Health Check (assessing your IT estate so ensure problem-free integration) and Quick Start packages, as well as BusinessObjects training. Further, BusinessObjects licence support and maintenance from Influential Software includes additional benefits. We have 22 years of experience in meeting Business Intelligence requirements with solutions that deliver significant operational benefits and ROI. See the vast client list below, including 30 SAP Business Objects licence clients we support today. We can supply and work with clients throughout the EU. Business Objects can help balance the risk and opportunity across your business processes with its ‘Governance, Risk and Compliance’ solution, and provides business analytics tools that will give you the insight you need into your business performance to make the right decisions. Contact us today to discuss how we can best meet your Business Intelligence requirements with SAP BusinessObjects. Leverage SAP BusinessObjects business intelligence (BI) solutions that can empower your users to make effective, informed decisions based on solid data and analysis. SAP Lumira: Data visualisation software to help you quickly spot and share new insights – without requiring IT resource. 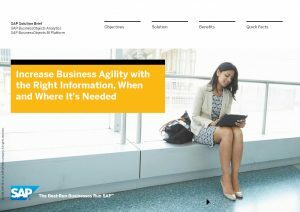 SAP BusinessObjects Web Intelligence: Answer new and evolving business questions with self-service ad-hoc reporting and analysis on the web, your desktop, or a mobile device. SAP BusinessObjects Design Studio: Create multi-dimensional dashboards and data visualisations for your BI apps – to put timely, actionable information at your decision makers’ fingertips. SAP BusinessObjects Dashboards: Get instant access to clear, understandable metrics, so you can see your key performance indicators at glance and know what’s driving your business. SAP BusinessObjects Explorer: Take advantage of an intuitive path to quickly search and explore data for instant insight into your business. Take advantage of SAP BusinessObjects enterprise information management (EIM) solutions that can help you deliver integrated, accurate, and timely data – both structured and unstructured – across your enterprise. Capitalize on the value of your corporate data, enabling your organization to become more agile and competitive by providing organizational alignment, visibility and greater confidence. Proactively balance risk and opportunity across business processes and respond faster to changing business conditions using a preventative, real-time approach to governance, risk and compliance. Gain insight into your business performance, so you can empower your team to make agile decisions and gain sustainable competitive advantage. Since 1993, we have been using our BI experience to ensure you buy the right licences at the lowest price, thus helping to deliver the best and most cost-effective solution for our FTSE-100 and SMEs alike. Talk to our dedicated BusinessObjects Team.